Anyone else noticed that this site seems to be getting slower every week? Hey Andy, I find the site is to cumbersome and slow compared to facebook. How have you been? We are good in our little part of the world. I am having no issues….pages just pop right up. Sorry not to be of any help. Hi Andy, hope you’re staying warm up there. I’m like redoak, no problems here, things seem to move as fast as they ever did. Andy, there are times lately when it is slow and other times not. Mostly slow lately. I hear that weather conditions can effect the speed. I’ve noticed that the more Wild Turkey I drink, the faster the site seems to load…. It doesn’t seem slow to me. There’s the occasional glitch but I get that on rare occasions with any site that I visit frequently. Speedy here.. keep in mind that it is not always the site you are visiting, but your connection and all the pipes needed to get there in between. Sometimes the large peer exchanges are flooded and cause a bottleneck for one person, yet another who has a different route doesn’t see any difference. Do a traceroute and you can figure out where the bottleneck is, if any. Have to agree with Brad. Check first to see what your connection speed is from your Internet provider. Try going to . . . BUT, make sure to use the ”BEGIN TEST” button, not the “START NOW” button. 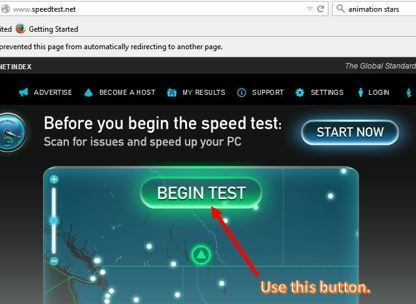 This site lets you perform a speed test at no charge via the “BEGIN TEST”, but they are also trying to sell you their software via the “START NOW” button. Here’s what you should see when you go to their site . . . This is the site that my Internet provider’s service staff use. I have had no problems with it giving accurate results, and it was my main tool in diagnosing poor connection speeds (as low as 0.01 Mbps) a while ago. Your speed results will show up in this format . . . Posting something or doing a refresh, the status bar shows progress in a ‘left to right’ fashion but kinda stalls about 20% into the process. So I don’t know what gets done at that point, but I wonder if it isn’t all the tracker and snoop engines that LJs allows. I just thought I was slower. mine seems a bit slow sometimes Andy ,and it seems like it a site issue but may be just my end not sure ,Smitty may be on to something . Personally I think it’s all the advertisements that have to populate the page. It’s very slow for me and sometimes even slower than that. -- When asked what I did to make life worthwhile in my lifetime....I can respond with a great deal of pride and satisfaction, "I served a career in the United States Navy." Personally I think it s all the advertisements that have to populate the page. It s very slow for me and sometimes even slower than that. I agree. If you do not block the ads, the pages load much slower. If you are using an an blocker, it could just be that your brain is running faster as you age making it seem like the site is slowing down!